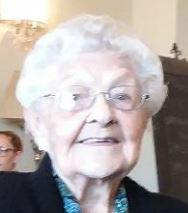 Obituary for Esther Lee | Stone Funeral Home, Inc.
Esther Lee, age 96, of Cheboygan, formerly of Bridgeport, MI and Zephyrhills, FL, passed away Tuesday, December 4, 2018 at The Brook in Cheboygan. She was born April 3, 1922 in Fort Collins, CO, the daughter of David and Mary (Kerbs) Fresorger. In 1942, Esther married Herbert Leon Lee in Bridgeport and he preceded her in death on March 22, 2012. Esther attended St. Paul’s United Methodist Church and enjoyed volunteering with hospice, traveling, cross stitching and camping with the Good Sam Camping Club. Survivors include her son, Randy L. (Sue Kowzan) Lee of Cheboygan, her sister-in-law, Carol Fresorger of Saginaw, seven grandchildren and several great grandchildren. Besides her husband Herbert, Esther was preceded in death by her daughter, Patricia McCurry and six siblings, David, Rueben, Robert, Henry, Frieda and Lydia. Visitation will take place on Saturday, December 8 beginning at 10:00 AM followed by the funeral service at 11:00 AM at St. Paul’s United Methodist Church. The Rev. Dr. John Bailey will officiate. Entombment will take place on Monday, December 10 at noon at the Oakwood Memorial Park Mausoleum in Saginaw. In lieu of flowers, memorial contributions may be directed to Hospice of the Straits. Arrangements are being handled by the Nordman-Christian Funeral Home.